A nightmare version of popular Red Riding Hood tale, Wicked Tales: Dark Red is a 5-reel 3-row 25-payline video slot machine featuring a jackpot of 4000 coins as well as tools such as Wilds, Scatters, Wandering Reels and the Fortress of Fortune Pick Bonus game. The game is a product of cooperation between Microgaming and Triple Edge Studios and brings a different and grimmer approach to the classic fairytale. 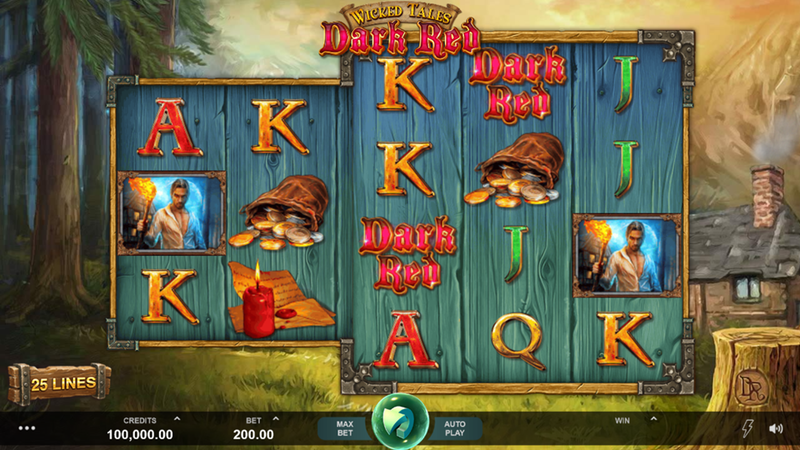 Read the Wicked Tales: Dark Red slot review and find out how to win them all. Want to see how Wicked Tales: Dark Red works? Select a recommended casino site from the list below and start playing for free or real – our screenshots will give you a sneak peek! You can play for fun or for real money, where the Read the Wicked Tales: Dark Red free play grants tons of demo credits for a fresh start. Both modes include detailed statistics, which will be useful to players of all experience levels. The coins range from €0.01 to €8 and you can place 1 to 8 per line, making it possible to wager between €0.25 and €200 per round, so it’s up to you which betting strategy to apply. To receive a prize according to the paytable, you have to line up 3+ matching symbols where themed such as torch-bearer, wolf or pendant have much higher rating than low-paying cards from Tens to Ace. For example, a beautiful girl and her savior pay a maximum of 4000 and 1600 coins, respectively. The game’s logo is the Wild and highest-paying icon as it substitutes all other items but the Scatter and pays 80, 800 or 4000 coins for 3, 4 or 5 appeared on an active payline. Thanks to Wandering Reels, a group of 3 reels that move together, you’ll have more chances to land a big win. Also, the same goes for Jumbo Blocks that create a massive block of symbols spanning across the reels. When collect 3 or more Scatters, you’ll trigger 1 out of 3 randomly-activated Wicked Tales: Dark Red bonus games. The first one, Fortress of Fortune Pick Bonus gets you to choose between different bags and reveal up to 10 cash prizes combined with the multiplier of a maximum 20x. The wheel-of-fortune-like item called Wolf’s Wheel Bonus is what you need to spin in order to claim 9 Wicked Tales: Dark Red free spins, cash prizes of 20x your stake or the Forest of Fortunes Pick Bonus feature. There are more extra prizes to boost your bankroll, each supplied with a raising Multiplier of up to 10x. You can play online using any modern mobile device. There is no need to download the iPhone app or the Android .apk file to play for fun or for the real money. 3. What is the RTP factor of Wicked Tales: Dark Red? The RTP official info gathered around the Microgaming-powered sites talks about 96.10%, while our Wicked Tales: Dark Red tutorial confirmed this figure. Visually-appealing and with a unique atmosphere, this is a title designed to satisfy a larger audience. Prospective winners should definitely try the Wicked Tales: Dark Red free play mode and get a better impression on the game’s mechanics. This way, you can surely improve your overall gaming experience.